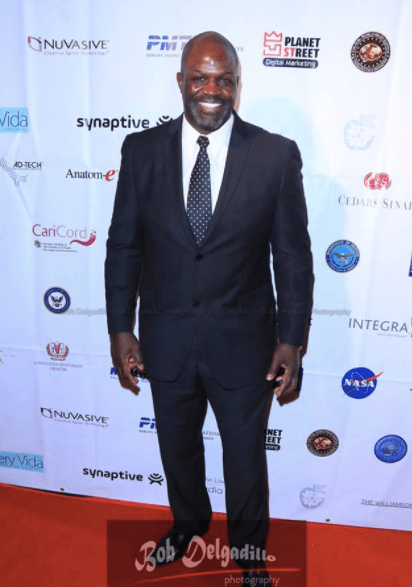 The Society for Brain Mapping and Therapeutics (“SBMT”), Brain Mapping Foundation (“BMF”), and the National Center for NanoBioElectonics (“NCNBE”) held their 14th Annual World Brain Mapping and Therapeutics Conference at the swanky Millennium Biltmore Hotel in downtown Los Angeles. SBMT was founded in 2004 to break boundaries in healthcare and to promote global interdisciplinary research to improve the diagnosis, treatment, and rehabilitation of patients with central nervous system diseases and disorders. 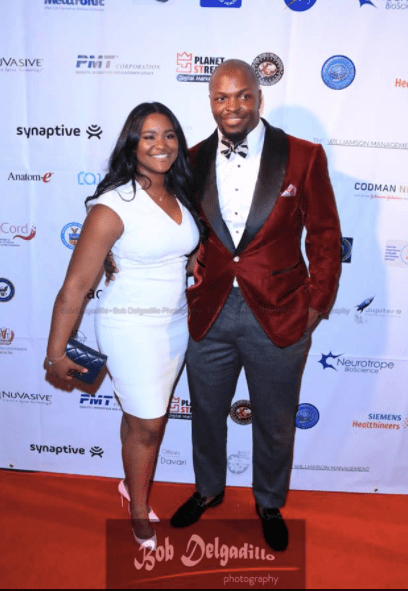 I was unable to attend, but was so impressed with the mission of this foundation that I was compelled to write a post and here it is. Annually, the Society and the Brain Mapping Foundation recognizes pioneers in the field of brain mapping and therapeutics with distinguished awards. 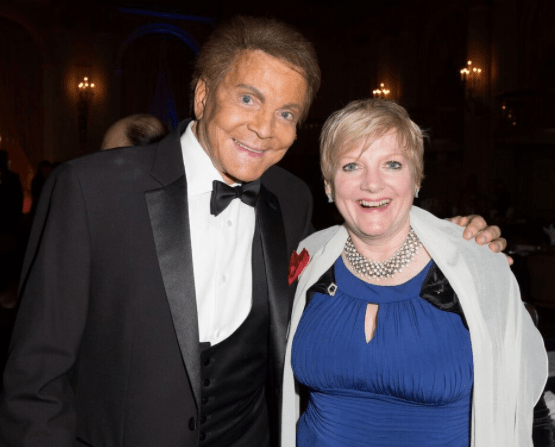 The Brain Mapping Foundation is holding its “Gathering for the Cure” black tie gala on Thursday, April 20th at the Millennium Biltmore Hotel to celebrate pioneering work of some of the world’s leading scientists, technologists, policymakers, and science advocates. The 2017 award recipients are as follows: Professors George Ojemann (Pioneer in epilepsy neurosurgery) and John Adler (inventor of Cyberknife) the recipients of the Pioneer in Medicine award; Congressman Jerry McNerney the recipient of Pioneer in Healthcare Policy Award, Professor Afsaneh Rabiei is recipient of the Pioneer in Technology Development; Travis Roy recipient of Beacon of Courage and Dedication; Golden Axon award for leadership is given to Drs. Wes Ashford (2016-17 President of SBMT), Michael Roy (2012-13 President of SBMT) and Drs. Nasser Kashou, Ajeet Kaushik, Alexander Stahn are the recipients of Young Investigator award. Dr. Peter Diamandis, Chairman of XPrize, is the keynote speaker at the Brain Mapping Foundation “Gathering for Cure” gala who will be speaking about global innovation. This remarkable scientific program is supported by industry leaders including: Fiagon, Fulgent Diagnostics, Space Bio-Laboratories Co., Ltd, Siemens Healthcare, Medtronic, Codman, Stryker, KLS Martin, Ad-Tech, Zeiss, Anatom-e, Nordic Neuro Lab (“NNL”), Synaptive Medical, Integra , PMT Corporation, HarleQuin Recruiting, Med Valley Home Healthcare Inc, Jupiter 9 Production, CariCord, Neurotrope BioScience, California Neurosurgical Institute, Nuvasive, the Law office of Nadia Davari, Planet Street Digital Marketing, Apex Photo Studios, Keri Ann Kimball of Kimball Entertainment, Joe Williamson of Williamson Management, SoVeryVida and Neuronavigation Dinamics. 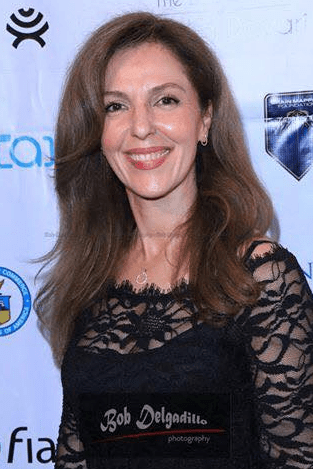 The scientific program of 2017 SBMT annual meeting has 320 speakers and 12 keynote speakers including Congressman Jerry McNerney, Space Traveler and Engineer Anousheh Ansari, Drs. Gary Small (UCLA), Laligam Sekhar (UW), George Ojemann (UW), Mark Humayun (USC), Wes Ashford (Stanford/VA Palo Alto HCS), Warren Boling (LLU), Kyu Rhee (IBM Watson Health), Dean Yamaguchi (Department of Veterans Affair), and RADM Colin Chinn (Defense Health Agency). 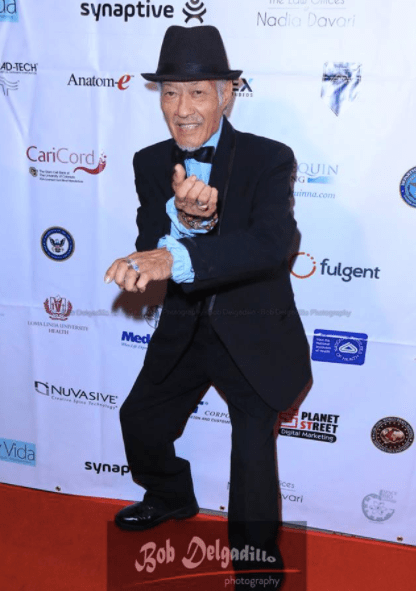 Many Hollywood celebrities including: Tim Kring, Jim Kwik, Matthew Rhodes, Charlie Corwin, James Hong, Kate Linder, Hank Garrett, Mel Novak, Aki Aleong, Navid Negahban, Ken Davitian, Eden Sassoon, Gary Graham, Jimmy Jean-Louis, James Kyson, Dru Mouser, Sophia Milos, Vida Ghaffari, Alison Arngrim, Jarrod Bunch, Max Amini, NFL player Alec Ogletree, Andrew Jang, Tony Denison, Rachel Sterling of Pussycat Dolls, Shanica Knowles, Sean Kanan, Apick Youssefian, Mary Apick, fashion designer Sue Wong, and entrepreneur and publisher Miguel R. Forbes were in attendance at the “Gathering for Cure” gala. 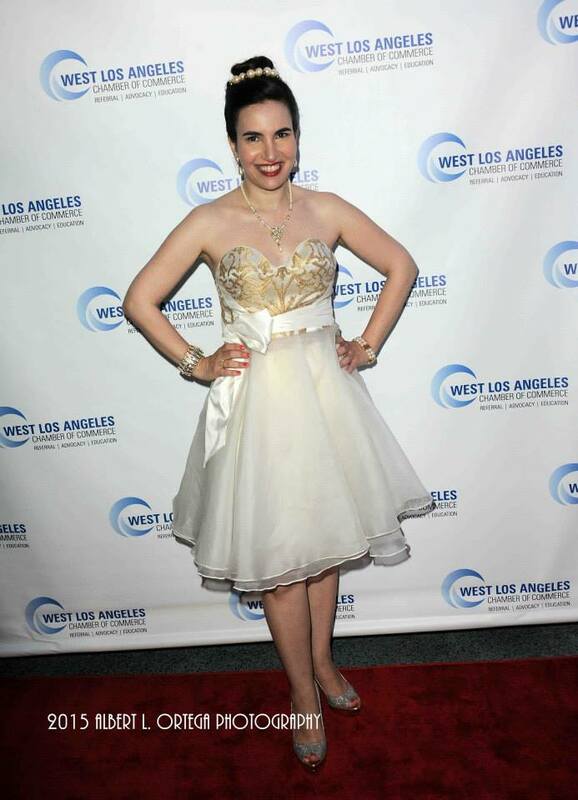 On June 18, 2015, grant and award-winning journalist, talented actress and voiceover artist, Vida Ghaffari, received a special honor for her career achievements by the West Los Angeles Chamber of Commerce at Delphi Greek Restaurant. 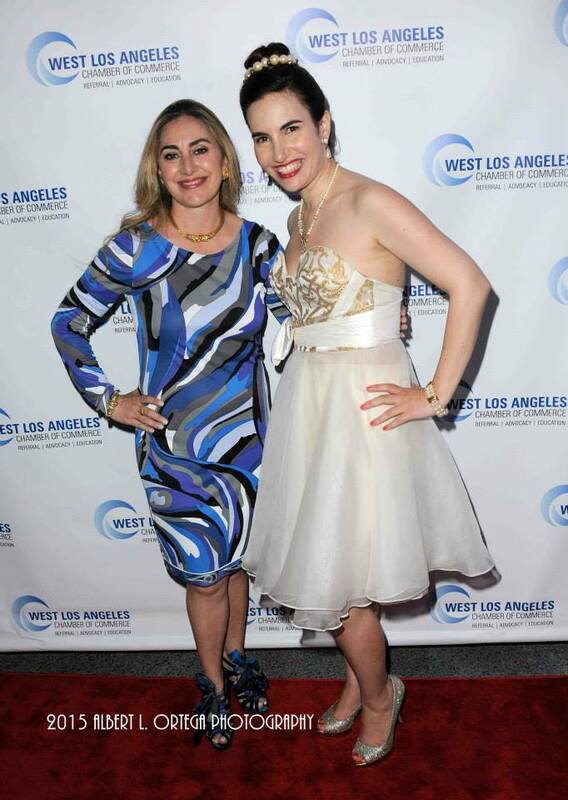 Roozbeh Farahanipour, the Chamber’s President and the owner/operator of popular Delphi Greek restaurant, which is located at 1383 Westwood Boulevard, bestowed this honor upon HPC’s own Vida, who is quite the roving reporter and working actress and voiceover artist extraordinaire! This multi-talented artist received a Certificate of Appreciation on behalf of the City of Los Angeles for all her hard work and dedication to the city, which was signed by 5th District Councilmember Paul Koretz. In addition to the Chamber holding this event in her honor, she also received an honorary membership to the Chamber. 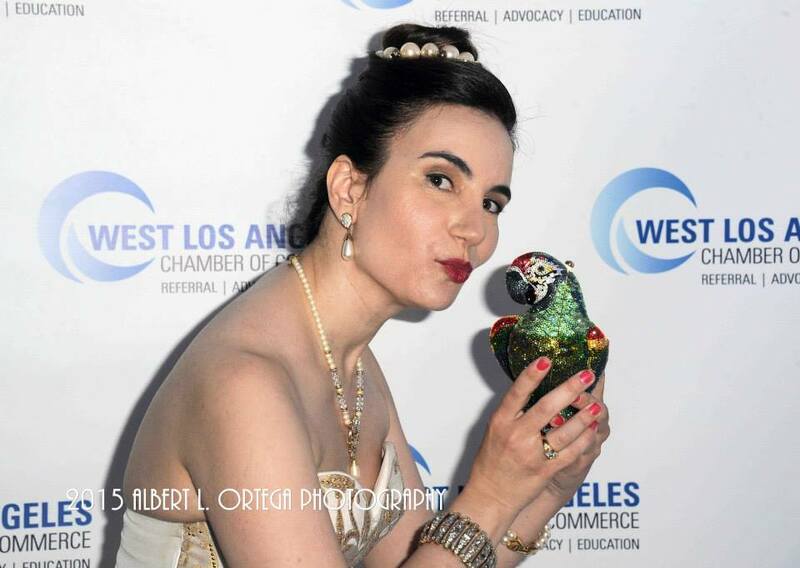 “I was truly honored by Roozbeh and the Chamber to receive this incredible commendation, especially as it’s one of the largest and oldest Chambers in Southern California. There is a real sense of community here and the Chamber does such a great job in fostering that community. I’ve covered their events for a while and it’s a great thing to see as a journalist in such a vast metropolis like Los Angeles,” said Vida. 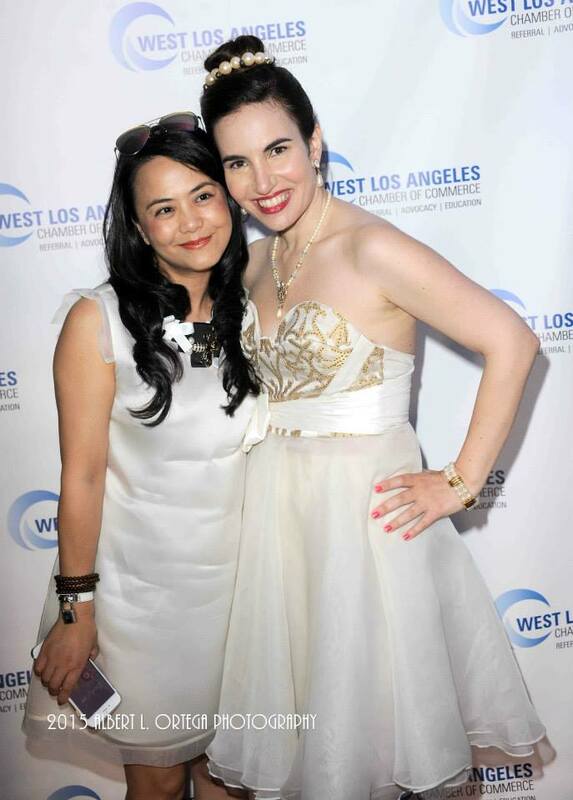 Vida receives her commendation from the West Los Angeles Chamber of Commerce. 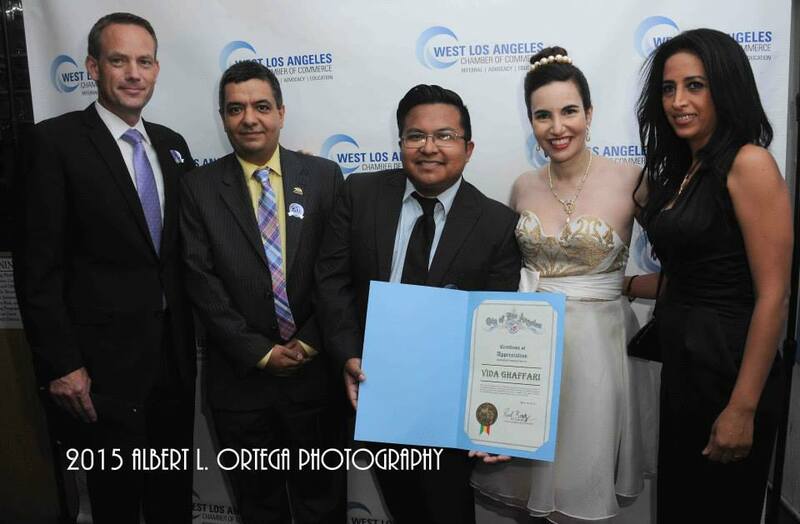 From left to right: Vice President Steve Little, President Roozbeh Farahanipour, Phil Bennett of the City of Los Angeles, Vida, and Elham Yaghoubian, human rights activist, author and handbag designer, and Board Member of the Chamber at the Ceremony. Photo courtesy of Albert L. Ortega/GettyImages. “When it comes time to honor one of their own, the West Los Angeles City Of Commerce picked the perfect choice. 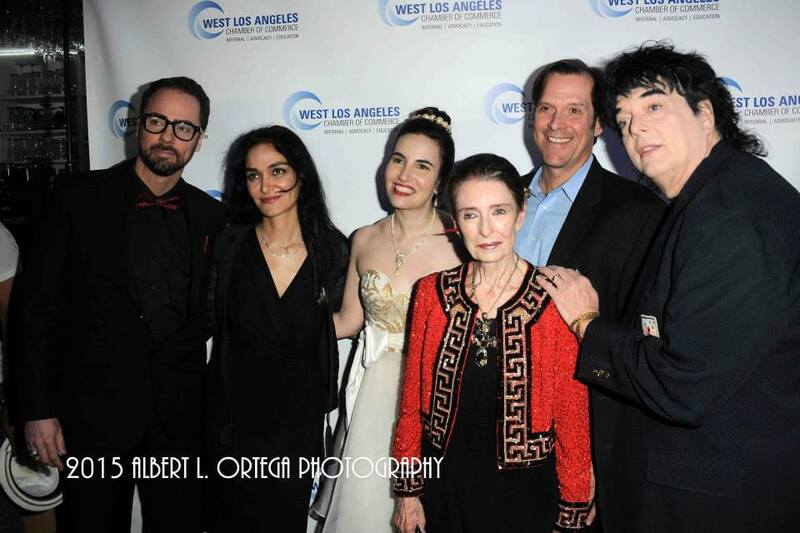 Hollywood stars, as well as, many of LA’s top creative and business icons came out to support and celebrate the amazing, Vida Ghaffari. 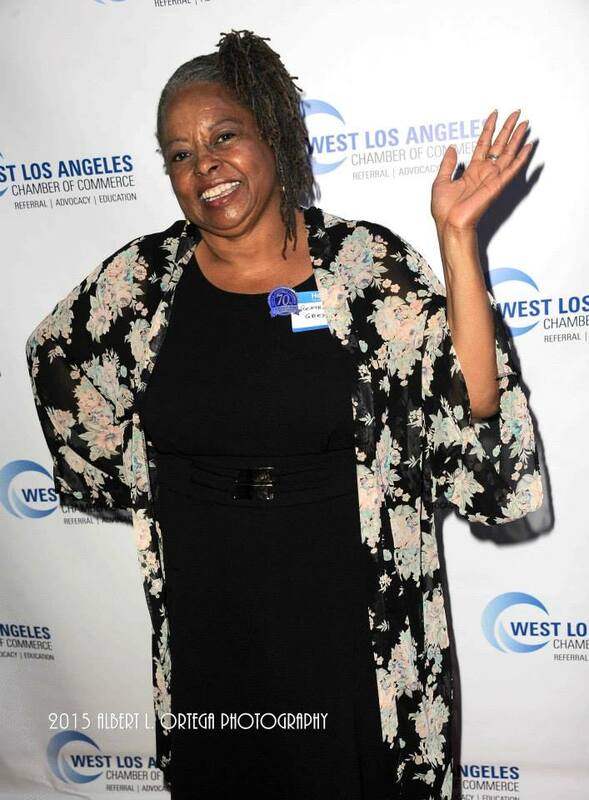 The Delphi Greek Restaurant in Westwood was literally “standing room only” with those of us who were there to show our love and appreciation for Vida…actress, writer, journalist, and someone who is very community-minded,” said acclaimed actress Suze Lanier-Bramlett. 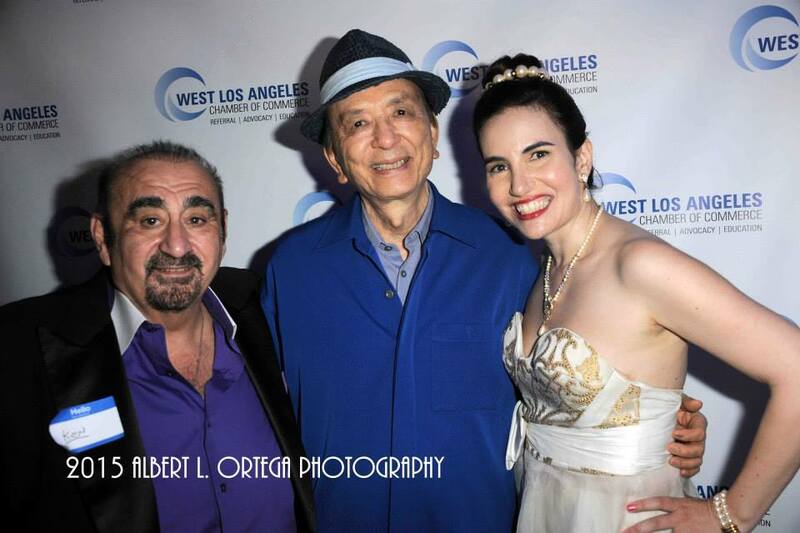 In addition to distinguished Chamber members and government officials, numerous acclaimed celebrities friends of Vida’s appeared to support her event such as legendary Oscar winner Margaret O’Brien (Meet Me in St.. Louis, Little Women), President of the Southern California Motion Picture Council and actor Randal Malone (Dr. Jekyll and Mr. Hyde, Dahmer vs. Gacy),legendary character actor James Hong (Kung Fu Panda 3, Mulan), Kate Linder (The Young and The Restless), Reatha Grey (Off Their Rockers, legendary Iranian actress Apick Youssefian (The Keeper: The Legend of Omar Khayyam, Cry of the Village), lifetime member of the Actors Studio Ford Austin (Pearl Harbor, Another World ), Suze Lanier-Bramlett (The Hills Have Eyes, Area 51), Anthony Azizi (Septembers of Shiraz, American Odyssey), and Film Composer David Raiklen (Mia, A Dancer’s Journey, Space Command Redemption). 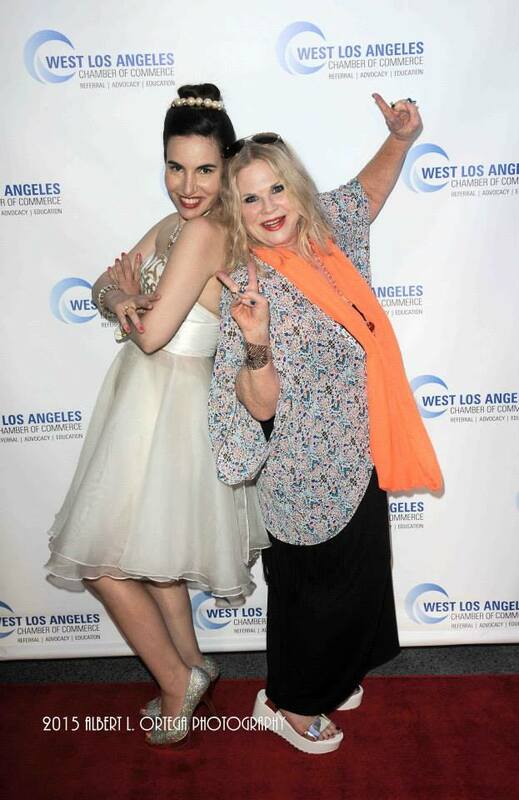 Because of Vida’s long standing relationship with the fashion community, designers such as Shekhar Rahate, Julia Clancey, Rita Mezrahi of Claires Collections, and up-and-coming designer Yuki Yim attended to show their support. 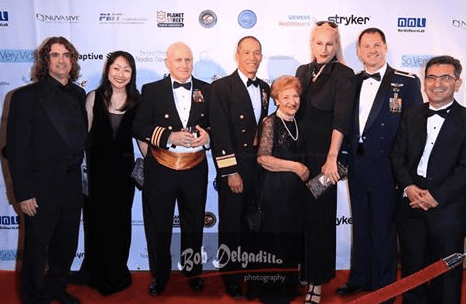 This star-studded event also had a regal air with royalty such as HH Prince Maximillian Ferdinand Von Anhalt of Germany, HH Prince Mario-Max Schaumburg Lippe, Nachod of Germany, and HRH Qajar Persian Princess Mandana FarmanFarmaian in attendance. Other VIPs that atteneded were city officials, along with well regarded international, national and local media. 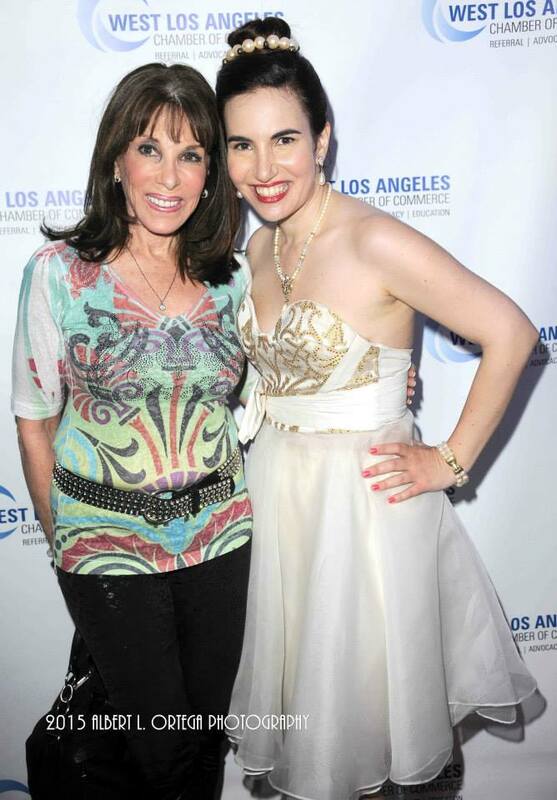 In addition to being a very successful and prolific journalist, Vida is best known for her appearances on the television comedies, Mind of Mencia and The Mindy Project. 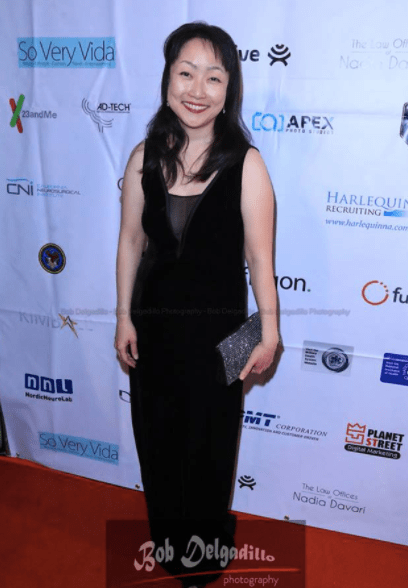 She will soon be seen in the films Pond Scum, Natural Born Filmmakers, Seeking Valentina and Strangers in a Book, which will screen at popular film festivals such as the FANtastic Film Festival and the Action on Film Festival. She is also about to host an exclusive launch event for her own blog about entertainment and fashion, www.soveryvida.com.